IMD recently released its 2016 World Talent Report and ranked the USA 14th (out of 61 participating countries) in the 2016 World Talent Ranking. Note: IMD is also known for its World Competitiveness Ranking and Business Competitiveness Report. IMD bases its World Talent Rankings on 3 primary factors: Investment & Development, Appeal, and Readiness. We focused on the Appeal factor which contains a list of indicators (listed under line graph) including the way enterprises prioritize talent attraction, ability to attract, and retain highly skilled foreign talent just to name a few. 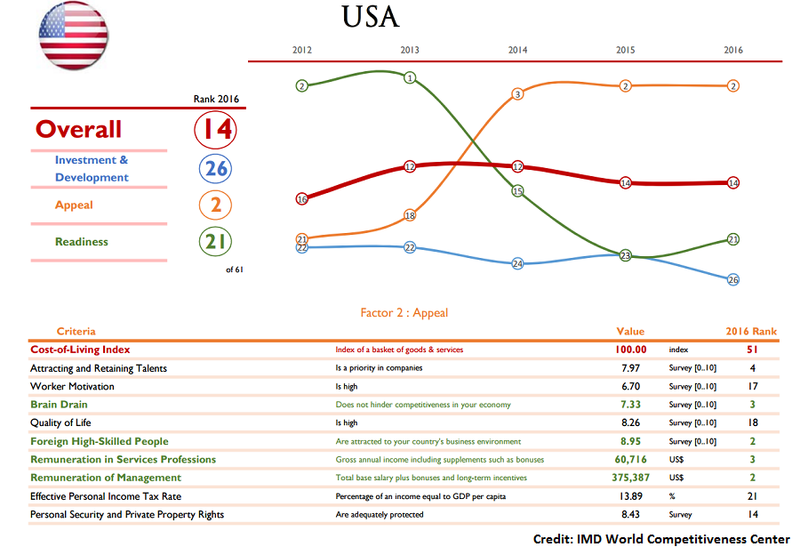 While the USA came in 14th overall in the World Talent Ranking, they were ranked 2nd in “Appeal” factor. Ongig's job description platform that helps you attract the best talent faster. Ongig supercharges your job descriptions through video, images, and other media along with live chat, social sharing, and careers microsite creation. Early clients of Ongig include Yelp, GoDaddy, Verizon Digital and Autodesk.